Manchester Friends of the Earth | Time is running out to save Wales’ Amazon rainforest. Time is running out to save Wales’ Amazon rainforest. The Welsh Government wants to bulldoze through the Gwent Levels – Wales’ equivalent of the Amazon rainforest for their diversity of wildlife – to build a new 14-mile-long six-lane motorway. Gwent Wildlife Trust urgently needs your help to stop their destruction. The Public Inquiry into the proposed M4 motorway was one of the longest ever run in Wales, the findings of which have still not been made public. We are expecting the Welsh Government to make a decision on the motorway any time soon – so time is running out! 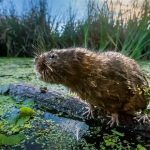 The historic and beautiful Gwent Levels in south Wales are home to otters, water voles, dragonflies, rare bees and wildflowers and the area is loved by the people who live and visit there. Please act now to save the Gwent Levels! Gwent Wildlife Trust fought the new motorway during the Public Inquiry – but now we need everyone who cares about nature to voice their concern about these destructive plans. The motorway plans cost the earth in every sense. It would contravene Wales’ excellent Well-Being of Future Generations Act and cost taxpayers around £1-2 billion pounds – for the sake of saving just 10 minutes’ journey time. Some of the most important sites for wildlife in Wales, including Gwent Wildlife Trust’s Magor Marsh nature reserve will be damaged or destroyed. We back Sophie Howe’s views – the Future Generations Commissioner for Wales – that Welsh Government should scrap these plans and instead of wasting billions on a new motorway, invest in a modern public transport system for the people of Wales. Please join forces with us to show the Welsh Government that people care and want to save this beautiful but fragile wildlife haven, helping them to make the decision to drop their plans to benefit the people they represent and wildlife.